There is, apparently, no honor among spiders. They feed on not only various insects but other spiders (provided they can overtake them) or the prey of others. They like to hide in dark areas and is especially fond of warm, dry spaces such as attics, ceiling corners of any room, or subfloor air vents. Some do dampness so buildings with crawlspaces and basements are just the type of moisture laden places where they can be found. There are literally tens of thousands of species around the world. What they all have in common are two body segments and eight legs, and pairs of eyes that can number either four or three. 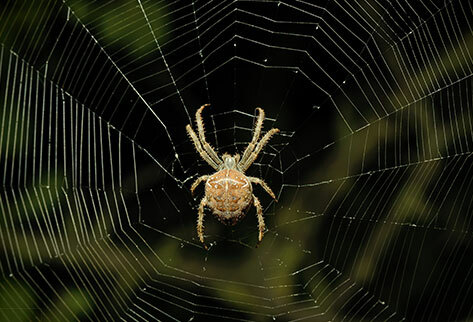 The most common indication that you have spiders is through the sighting of their infamous spider webs. The shape of these webs can vary, sometimes being funnel shaped and other times being orb shaped. Some species prefer taking refuge in cracks and crevices, but they can also live in burrows. Storage boxes, closets, ceilings, and wall junctions are favorite locations as are attics, sheds, basements, and sometimes moist spots (though some prefer dry places instead). Areas that are plentiful in insects are a good place to find spiders because that is what they feed on. There are a number of home remedies that people insist work, such as peppermint oil, citrus, cinnamon, etc. There are, of course, sprays on the market that will kill spiders on contact. But in order to make sure that spiders never come back, you will need to eliminate their food source – which could easily be moths and other bugs that are attracted to your porch light. Additionally, sealing up nooks and crevices will be helpful. Ideally, however, a professional pest control service will not only get rid of the spiders you currently have but take measures to ensure that your home will be spider free in the future as well. How do spiders get into my house? Most likely, the same way you do – through open doors. They also find gaps around window frames, cracks in buildings, and poorly screened windows. Additionally, they love riding around in boxes and can also come in on items that you took outside for a while, but are now bringing back into the house. When they enter, they are likely looking for prey or to mate. Do spiders have good eyesight? Though they can have up to eight eyes, they are notoriously nearsighted. Some spiders only have six eyes, but the nearsightedness is the same. Some of the eyes are responsible for creating images while the others primarily detect shadow and light. As far as seeing into the distance, however, though we see nearsightedness as a problem, it doesn’t seem to act as a deficiency in their case. How far can jumping spiders jump? Ordinarily, they will only jump if they are trying to escape or when they are hunting, but they are exceedingly agile and can hurl themselves a distance equaling 50 times their length. They have a type of internal system of hydraulics and can literally adjust the fluid pressure in their legs. Need Help with Spider Control Today? Having been in business for over 30 years, PEST is the ideal pest control provider that can eliminate your pest problem now and into the future. Many people wait until they are fully aware that they have a serious infestation. But if you even suspect that pests may be a problem, our PEST team can find out for sure and take care of the issue once and for all. Keep those spiders outside where they belong, not in your home. Call us at 212.945.0868 or email us at info@pesteliminationsystems.com to get started. 2019 © PEST ELIMINATION SYSTEMS TECHNOLOGY, Inc.